The Overlords have commanded us to READ, but you could scroll to the bottom for TL;DR! I had been reading The Wheel of Time series by Robert Jordan on and off since about the time the first book was published in 1990. By the time I started running marathons in 2004 I had read all the books to that point and started listening to them all again while out training. They are fun and full of enough action to keep the miles from being dull. Jordan’s death in 2007 left that series incomplete and left loyal readers wondering if or how it would finish. Brandon Sanderson, fantasy author and reported Wheel of Time fan, was brought in at that time to finish the final three books based on Jordan’s notes. By most accounts, including mine, he did a spectacular job and wrote some of the best books of the later series. I hadn’t read Sanderson before that point but had heard the Mistborn series mentioned. Once I put the two together I put Mistborn: The Final Empire on my reading list. 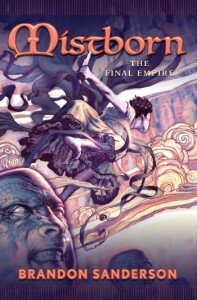 Mistborn: The Final Empire kicks off a four book fantasy series, or what seems to me more of a trilogy and a related sequel set a number of years in the future. In it, Sanderson does some playing around with the basic idea of the prophesized hero coming to save the world (What if Rand failed in his ultimate mission in the Wheel of Time?) and ends up with a solid series that I found both unique and entertaining. Mistborn: The Final Empire lays out the setting of this new universe as feudal empire that has been ruled over for the past one thousand years by a dark, brutally oppressive, immortal Lord Ruler. He seems to be a sort of Sith Emperor with the expected magical powers, lurking in the shadows. The rest of the population is purposefully split by class between the noble ruling class and the practically enslaved working class, called the Skaa. On top of that setting, Sanderson has created what I found to be some unique and creative systems of magic based around various mystical uses of metals and alloys. In this book we mostly learn of the first, called Allomancy, which is the eating/drinking and “burning” of certain metal types to use their associated powers. These magic users are called Allomancers, with Mistings (single metal burners) and Mistborn (able to use all types) being two types. The narrowly defined powers per metal type and consumption of metal reserves creates a balanced plot device that allows magic with enough drawbacks and weaknesses to make the story situations work without seeming forced. Sanderson also does a good job creating a set of characters with some level of depth that you can be interested in and care about. Add in some evil minions and strange creatures tied into the story (Steel Inquisitors with metal spikes for eyes, body copying Kandra doppelgangers, and brutish, orc-like Koloss), and a couple ominous, unseen, overlord gods and there is plenty to sustain a trilogy. I was pretty impressed at the uniqueness of the magic systems. The powers they offer come with the built in strengths and weaknesses that seem very natural and believable, but still offer some amazing capabilities that can be surprising even after you learn the rules. The twin powers of “pushing” and “pulling” of metals, for example, seem simple enough on their surface, but result in some interesting images and choreography that might be fun to see in a movie someday. The systems of magic, a somewhat feudal style political system of Nobles and Skaa both being manipulated in various ways, and mysterious dark forces at play in a wrecked world make a complete if not super complex fantasy backdrop. The development of the main character Vin, the young, oppressed, half-Skaa street urchin who discovers she has Allomantic powers, is relatively natural and believable. The downtrodden young orphan coming into magical powers is a recognizable piece of plot, but still a likely place to start. Kelsier, the early plot driver and mentor figure to Vin is a great character and a model charismatic, roguish hero of the moment. While the plot in this book and the rest of the series focuses on Vin, and I really like strong female lead characters, I think I might also have liked a Kelsier focused series. The handful of other characters introduced in the book are interesting but not as developed. We learn more about them later in the series which helps. Of the “Lord Ruler” we know very little, and even less of the powers behind him and his actions. The lack of development of the antagonist side of things in this first book make it feel a little more like an incomplete mystery than an epic battle of the ages, possibly by design. Most of settings are pretty bleak, ugly and oppressive to the reader as much as to the characters. It works and makes sense but can be a bit dark. As a side note, I think this would be one of the biggest limiting factors in creating a faithful movie version of these books. There’s just not enough brown paint and black ash in Hollywood to come close to creating a movie set. Overall, I liked Mistborn and would recommend it. The unique world and it’s magic systems packaged inside the twisted backdrop of the “what if things went wrong” concept do work. Lighter in characters, complexity and depth than some other epic fantasy series it still holds together well and pulled me quickly into an easy read of the first three books. I recommend it!